Monday saw the doors of Egypt’s People's Assembly (the lower house of parliament) open for the first time in a month following President Mohamed Morsi's decree which reinstated, Sunday, the legislative authority that had been dissolved by the Supreme Council of the Armed Forces (SCAF) on 15 June. Despite the presidential order allowing the People's Assembly to function as normal, several liberal and leftist parties have rejected the decree and announced they are refraining from participating in the parliamentary sessions which are set to resume Tuesday, as announced by parliamentary speaker Saad El-Katatni on Monday. Egyptian Social Democratic Party (ESDP) MP Emad Gad stated Monday to Ahram Online that his party —which gained 16 parliamentary seats out of a total 332—will boycott the meetings as he considers them "legally void" whilst the fate of the parliament is still in dispute. "The Muslim Brotherhood has decided to enter into a confrontation with the SCAF and so the ESDP will not take part in an act that the Egyptian people will only be hurt by," Gad explained. Gad further asserted that the ESDP respects decisions made by the High Constitutional Court (HCC), including the ruling that Egypt’s parliamentary elections law was unconstitutional leading to parliament's dissolution. The Leftist Tagammu Party—which gained 3 seats in the parliament—issued a statement Monday confirming that it would also avoid the sessions, as parliament convening was in "outright defiance" of the HCC’s ruling, aiming to "destroy" the basic structures of a nation state and "incite a state of chaos" by not respecting the judiciary and its decisions. In addition the Liberal New Wafd Party—which won 38 seats— is joining the boycott, describing the presidential decree as "arbitrary". However, not all the party members agreed. New Wafd MP Hanan Abul-Gheit announced, Monday, she would not abide by her party’s decision due to the "undemocratic" way in which the group action was determined within the political group. Following the contentious presidential decree, several meetings have been held by Egypt's top officials. The SCAF held an emergency meeting late Sunday to discuss the matter but no official statements describing the outcome was released. The HCC convened on Monday but revealed that it would not be involved in the political struggle currently being played out between the SCAF and the president. Instead the court confirmed it would wait for a final decision from Egypt’s Administrative Court. Meanwhile, a number of cases have been filed against the presidential decree. Alexandria's administrative court is set to look into one of the cases calling for the suspension of Morsi's presidential decree on Tuesday. Clearly, these are the only MP's who respect our constitution and laws, have dignity and truly care for the interest of their country and not their personal interests, by refusing to re-claim their seat which they campaigned hard for and earned by personal sacrifice, out of respect for the law. Unlike the brotherhood who drool over any chance to consolidate power even if they trample all over a constitution, law and personal dignity. SCC/HCC can only rule Parliment's constitutionality....It's up to the EXECUTIVE then. The SCC/HCC ruled on the constitutionality of Parliament. It was doing its job correctly. SCAF used the executive powers it had. SCAF, although is unelected, did right it then. Now, The President, acting on behalf of the Egyptian People, not as a an individual MAN, reinstated Parliament. Both SCAF and The President are in agreement about the need for an election once the CONSTITUTION has been ratified. Both SCAF and The President didn't contravene the SCC/HCC. Hence the SCC/HCC need not be involved. So the MPs should get on with their duties and move on. It will only be that the validity of legislation they pass maybe questionable. So what? At least Parliament is there. Otherwise legislation can still be passed by SCAF. That is not what the Egyptian People want. There isn't any need for confrontation. Leftist and Liberal should support the President's decision otherwise democratic institution will not be founded on strong footings. As they are not supporting President's decision, they are indirectly supporting the SCAF and HCC against which people of Egypt raised their voices and staged a successful revolution. The SCAF dissolved Parliament. It was right then. Now Egypt has an ELECTED PRESIDENT of the People. The President has every right to do what he deems fit for the Egyptian People who put him into office. SCAF cannot strip him of his legitimate authorities as a President elected by the people. Now it is for SCAF and The President to iron this out between them. The HCC/SCC need not be involved as real gentlemen. 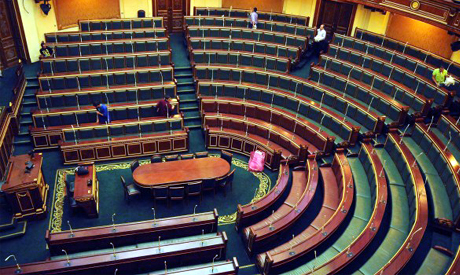 MP's should carry on their role as the elected representatives of the Egyptian People. It is that simple. NO CONFRONTATION NECESSARY. The fools on the left don't get it. That's because they're more dedicated to the idea than lifting the people out of misery. What a f... is wrong with making the next fight a little easier on the poor and unemployed? What about the rest 97% MP's...? You headlined with 3% who are boycotting...what about thes rest 97% MP's..???? Why dont you tell the world that 97% are attending while few so called "liberal" will follow the SACF rulling..